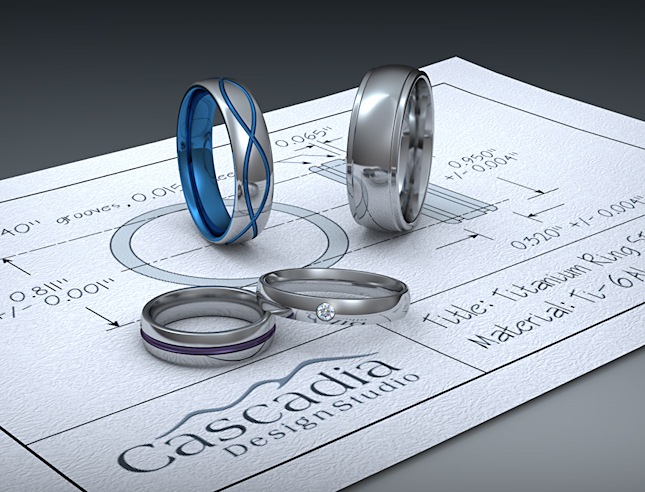 Cascadia Design Studio, founded in 2000, designs, fabricates, and sells custom, made to order Titanium Rings. We’re located in Washington State, 30 miles north of Seattle. As a small growing jewelry company we could not afford to outsource any marketing tasks. Web design, graphics and photography were all skills that had to be learned quickly. Modeling/CAD software used: Moment of Inspiration (MoI), a NURBS modeling tool created for designers and artists. Jewelry photography is especially challenging and time consuming due to the highly reflective subject. We wanted consistency in our product images and the ability to switch backgrounds later without “Photoshopping”. These issues prompted us to look into 3D modeling and render solutions. Searching the web turned up many examples of rendered jewelry. Unfortunately the majority had a fake “CAD” look about them. The few good renders we found were made with software beyond our budget and had high learning curves. After discovering KeyShot and seeing its high quality renders of all types of objects and materials, I knew this was the tool we needed. Coupled with a low cost modeling program that plays well with KeyShot, we now had a complete 3D tool set at a very reasonable cost. Once we modeled our product line in MoI and fine-tuned the KeyShot materials, we started replacing the old product photos on the web site. An initial concern was whether customers would accept the images as real. Our fear went away when a professional product photographer commented on our “great photos”. We also use KeyShot in the jewelry design process, web site development, and for customer quotations. Customers are amazed when they inquire about unique material & color combinations and receive an image matching their description minutes later. We have sold jewelry, based on just the photo-real render, before the actual prototype was even fabricated. KeyShot has allowed our small business to produce imagery in-house with quality that meets or exceeds that from larger companies with extensive marketing budgets.